Kara checks herself in the mirror for what must have been the third time in as many minutes. Wearing her usual one piece outfit, painted bright blue with a silver dragon emblazoned on her left side she cuts an imposing figure especially compared to her smaller partner. Vita, meanwhile is watching her fidget while leaning against the wall. Her partner is wearing her shortcut buttoned suit, shorts and gloves, this time colored a very dark green. Kara had been like this ever since she found out that they had gotten a tag match lined up with Kyo and Makie. She has every reason to be nervous of course, she had lost her last match with Kyo after all. Kara steps away from the mirror again, walking to the bench near the door before pacing back to the mirror. She had been going over recordings of the last match she had with Kyo for the last few days. Examining where she had gone wrong and what she could have done differently, to the point that she is sure she had memorized a good chunk of it. She still remembers how close the end was, the two of them barely able to stand, Kyo barely conscious and in her arms. She notices she had drifted off into her own thoughts and that Vita was smiling at her. Just then a stage attendant comes around and gives them their cue. “Yea I got you covered,” Vita says as they step onto the entrance ramp and into the light. Compared to the relative silence and darkness of backstage the ring is overwhelming. Everything, the lights, the dull roar of a stadium full of people, is borderline overwhelming. And she never gets tired of it. And then their music starts. Vita’s choice in music could at best be called eclectic but for once Kara thought it fit their team. The two run into the ring, Vita sliding underneath it while Kara climbs in between the ropes. Kara waves to the crowd before going to their corner while Vita does a full lap around the stage, doing a cartwheel at the end to show off her agility. Their intro done, the two take their places at their corner as their music dies down, awaiting for their opponents to arrive. In the other locker room, a different kind of pre-match ritual was going on. A small wicker of incense had been lit, and Kyo was sitting cross legged on the bench, already wearing all of his ring gear except for his boots. A towel was draped over his naked shoulders, and his eyes were closed as he cleared his mind, letting all thoughts of anxiety and conflict spill away and letting tranquility fill his mind. It was something he had started doing lately, as a way of maintaining his calm mid-match-- especially since, well, almost anything could happen once he and his opponent started throwing down. He and Makie had been slated for a bout with Kara Vela and Vita Cremashi. He had fought Vita once before, and one, while Makie had fought Vita soon after, and had lost. The powers that be decided that a scored needed to be settled. As always, Makie popped in just to ruin his tranquility. His eyes snapped open, and he sighed as he glared at his beaming sister. "Yes Makie?" "Oh, nothing, the match is about to start!" Makie replied with a mischievous grin. She was wearing her own red and white one piece, and her grin seemed to widen when she noticed that she had, once again, successfully irritated her brother. "By the way, why are you blushing?" Kyo blinked. "What?" He realized that he felt a flush of heat on his cheeks-- he had been blushing a bit, it seemed, when he had been thinking of his match with Kara. "I...wasn't. Just your imagination." Now suitably flustered, he began to slide his boots on. "Anyway, what have I said about interrupting my meditation?" "Do it often, and loudly?" 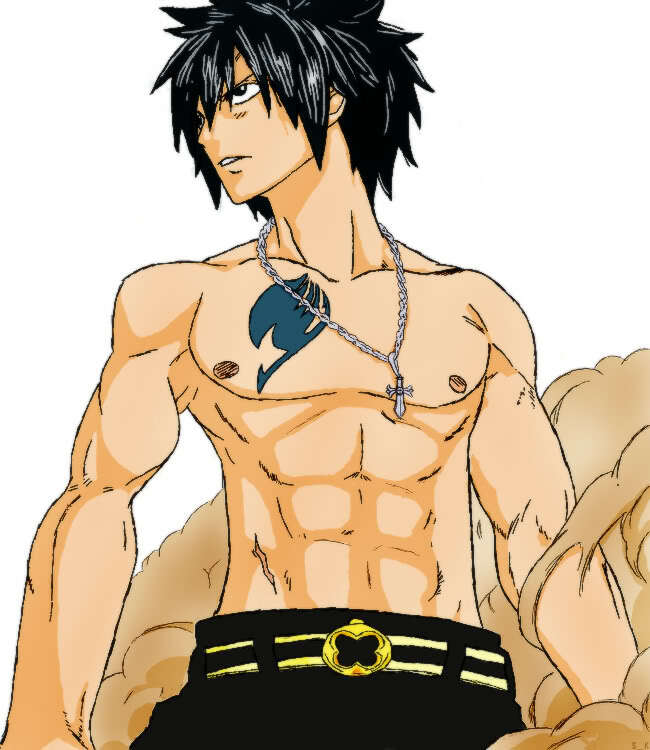 "No," Kyo groaned as he stood up, rotating his shoulders. "Let's...just go, shall we?" A few seconds later, Kyo and Makie were striding down the ramp, to the applause of their many fans. Although Makie was waving back at her adoring fanbase, as usual, Kyo's attention was focused on the distant ring. Kara and her partner were there already-- like last time, Kara cut an impressive figure, her almost perfectly sculpted body hugged by her blue outfit, her dragon emblem flashing in the arena lights. He felt a slight tremor at the base of his spine as he locked eyes with Kara. The Cubana would be out for vengeance this time-- and Kyo had no intention of holding back today. He was going to show her that his first win had not been a fluke. Sliding under the ropes, Kyo strode into the ring, fixing his eyes on Kara, momentarily ignored her smaller brunette companion. As he stood face to face with Kara, he did what decorum expect of him, and bowed modestly to his opponent. "We meet again, Vela-san," he said. "I'll admit that I have been looking forward to our rematch. You gave me quite a fight in our last bout." He briefly locked eyes with her again. "Though if you think you'll have it any easier this time, you're mistaken." Kyo could almost feel the tension building in the air between them...until Makie cut in. "Um...hi, I'm Makie," she blurted behind Kyo. "You'll be fighting me too. Nice to meetcha." Kara and Vita were talking with each other when their opponent’s music starts to play. Vita looks positively eager, but as Kara looks over to the two approaching the ring and the focus on Kyo’s face she goes quiet. He’s already trying to stare her down, maybe trying to intimidate her? Kara mets Kyo’s gaze as he climbs into the ring, she can feel her heart thumping in her chest. When Kyo speaks a smile creeps across Kara’s face and she tried to imitate the bow. When Makie speaks up she blinks and looks at her. Apparently she had got a bit too into her act. Vita, who was still sitting on the ring corner hops down and waves at Makie with a big smile. Kara looks at Makie, who’s still got a huge grin. “Hey I’m Vita, happy to meetcha,” Vita says to Kyo, holding out her hand. "Eh?" Kyo blinked as the newer girl hopped into view. 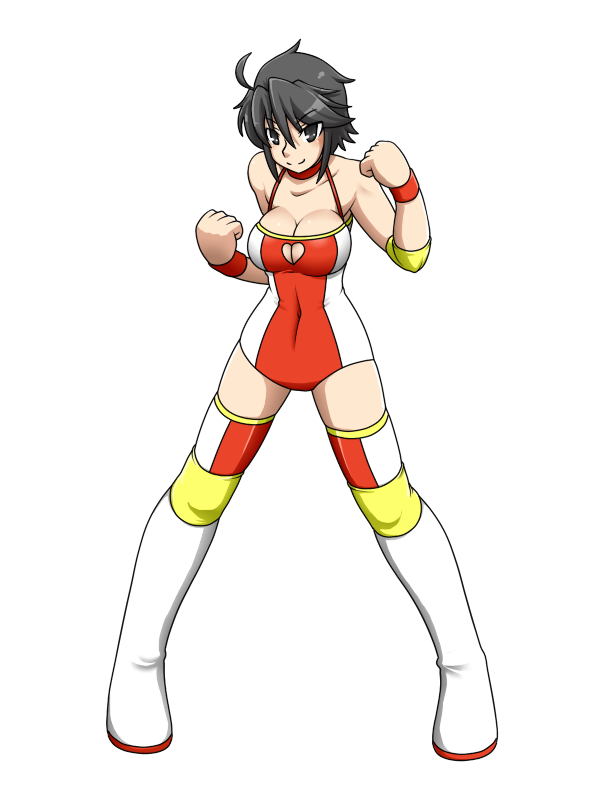 He quickly remembered this girl from one of Makie's bouts-- a spritely high-flyer named Vita Cremashi. Apparently, today she was going to serve as Kara's tag partner-- which meant he and Makie each had a rematch on their hands. He blushed a little, and forced a smile. "Um...hi...nice to meet you too! I quite enjoyed your match against Makie-- you showed a lot of aerial skill." "H-hey! Who's side are ya on?" Makie growled at her brother, before turning back to Vita. "And as for you...heh, we meet again. You got lucky the last time now...this bout will end a LOT differently, I'm sure." She made a knowing wink at Vita, hoping that neither Kyo nor Kara would catch on to it. Unfortunately, Kyo was more attentive than she gave him credit for. "What was that wink for?" he asked. "UM...OH NOTHING!" Makie laughed nervously. "S-so, which of us wants to start off?" Before Kyo could respond, Makie slid behind him. "Oh, you wanna go first Kyo? That's great, I'm sure you can handle either of these two!" she said as she backed away to their corner. Vita would have returned Vita’s wink with a barely contained smirk but Kyo catching on makes Vita turn away quickly to try and hid her expression. “So Kara you want to go first yes, great, go get ‘em,” Vita says non-stop as she walks to her corner not giving Kara a chance to reply. “W-wait what?” is all Kara can say before Vita slips between the ropes and the bell rings. Kara looks towards Kyo who seems to has decided to go first. Or rather he had been left as well. When Kyo looks to see who he’s facing Kara will be standing there looking confused. Kara will offer a test of strength, watching Kyo expectantly. For a brief moment, Kyo could only stare in confusion at Makie, then at Vita, then at Kara. It wasn't like Makie to willingly go second like this-- she was always raring to go first, to prove her mettle against whoever the other team decided to send out. It was rarer still for her to encourage Kyo to go first like this, since, as she put it, he always "stole all the fun," whatever that was supposed to mean. If Kyo didn't know better, he'd say she was up to something. The fact that Vita was practically pushing Kara into the ring made it seem all the more odd. Still, he wasn't going to turn down the honour of going first. He turned back to Kara, quickly glancing over his opponent and her powerful figure, and smiled at her comment. "Good," he replied. "I'll be honest, I've been looking forward to this rematch as well." He raised his arms in a mirror to Kara's own gesture. Kara smiles at Kyo’s response, and happily steps forward to meet him. She barely needs the encouragement, and when Kyo approaches she meets his tie up without thinking for a second about him pulling a trick. “Then come at me!” Kara says just before the two lock up. Kara will try to push Kyo backwards to see how their strength matched up this time, before trying to twist his arm into a wrist lock. In an instant, the two of them were locking up again, pushing and twisting, collar and elbow, and a classic tie up. Kyo had intended to be the one to take the initiative in this little dance, but Kara, for a change, was one step ahead of him, suddenly twisting around behind him and, fittingly enough, twisting his arm painfully behind his back. He sucked air in between clenched teeth. "Not bad," he hissed, before suddenly spinning, hoping to get behind Kara and reverse the wrist lock into one of his own with some classic chain wrestling. Kara grins as she manages to get Kyo into an arm lock, a much better start to this match than their last one. “Been practicing my technique, how’d you like it?” she says with a taunting tone at the end. Kara knew Kyo was going to try and reverse her hold, still he was too quick to stop from getting behind her. Kara takes a sharp breath as her arm is locked into place. She would make it look like she was going to spin around and put Kyo in the same move. However as she gets behind Kyo instead of locking his arm behind him Kara will try to instead swing him towards the ropes. Although there was a taunting edge to Kara's reply, he had to admit, a part of him kind of did like the fact that Kara had been improving since their last bout. He had been looking forward to a rematch against the Cuban amazon, and by the looks of things, she had been doing the same. The fact that she had been looking forward to fighting him again made him...thrilled? Excited? Gratified? Of course, that didn't stop him from reversing Kara's hold.